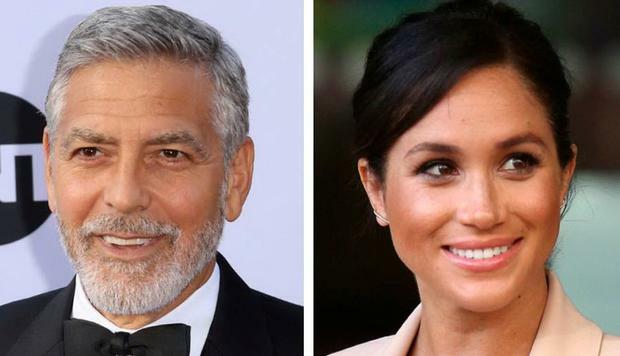 George Clooney's suggestion that Meghan Markle is being "pursued, vilified and chased" in the same way as Princess Diana has raised eyebrows. The former TV doctor turned Hollywood megastar who is said to be friends with the Sussexes (although no one quite knows how or why), this week claimed that "history is repeating itself" and warned: "We've seen how that ends." The 57-year-old actor spoke in the wake of the fallout from a US magazine interview, in which Meghan's closest friends revealed she had written to her now-estranged father Thomas Markle in August, begging him to stop talking to the media. A Sunday tabloid subsequently published parts of the letter, after Mr Markle claimed that he wanted to set the record straight - reportedly prompting Kensington Palace to consider legal action. "I can't tell you how frustrating it is to see that. You're taking a letter from a daughter to a father and broadcasting it everywhere," added Clooney. "She's getting a raw deal there, it's irresponsible. I'm sort of surprised by that." Perhaps more surprising is that such a comparison should be made 22 years after Diana's death, in an era which has arguably never seen royal privacy more respected by the British press. Is seven-months pregnant Meghan really being "pursued, vilified and chased" and if so, by whom? Certainly not the paparazzi. As one photographer, who wished to remain anonymous, said: "The regulations - IPSO (the Independent Press Standards Organisation), Leveson - have had a massive effect on us, which is why you simply don't see pap shots of the royals in the papers anymore. I think I've seen pictures of Meghan going to yoga once. There was another of her out in Notting Hill last month. That's about it." Veteran royal photographer Arthur Edwards, who photographed Diana throughout the 80s and 90s, agrees that "it's nothing like the old days". "There are no paps chasing Meghan whatsoever," Edwards insists. "In Diana's day, they used to photograph her going in and out of the gym; they'd get in the lift with her at Gatwick. What pap shots have we seen of Harry and Meghan? There was a race to get the first picture of them together after news of their relationship broke. Kensington Palace could have prevented that by releasing a picture of them to the media, but they chose not to. Since then, they have been completely left alone." Even palace aides have struggled to identify times when Meghan has been chased or pursued although, "there have been a number of occasions where a line has been crossed", a source says. (Such is the lack of intrusion that no one outside their inner circle has even discovered the name of their labrador - let alone seen photographs of the royal couple walking it). "That's probably a good thing, especially for the likes of George, Charlotte and Louis," he adds, referring to Prince William and Kate Middleton's children. "I remember Harry starting nursery and there were 30 of us there - he hated it. William used to say: 'I hate 'tographers.' We used to turn up at the start of every term and at every school play. The princes have put a stop to all that. Clooney can try to shoot the messenger as much as he likes, but the reality is a lot of this negativity is coming from the Markles." Veteran royal reporter Robert Jobson is among many who have questioned the wisdom of Meghan's friends speaking to People magazine. It is thought unlikely they would have given such in-depth interviews to the US's bestselling weekly without Meghan's permission. Yet Kensington Palace did not appear to have advance warning of the piece hitting the newstands last week. "If her friends are going to bypass the palace press office and brief magazines, then a lot of these issues become self-generated," says Jobson. He agrees with Edwards that the worst of it is coming from her own family members: "The press coverage of Meghan has been largely positive bar a few reports about her behaviour in the run up to the royal wedding. The only vilification of Meghan is coming from her own family and a few online lunatics." Royal author Sally Bedell Smith "shudders to think how Diana would have coped with a world of internet trolls", but points out that, at 37, and having built a successful career in a tough environment, Meghan is much better equipped to cope. "Meghan sensibly shut down her blog and her Instagram account, and as far as I know, she is off that grid." So has Clooney made the classic mistake of tarring all media with the same brush and confusing legitimate royal reporting with online invective? According to Phil Dampier, who was a royal editor at the height of Diana's fame: "I don't think Meghan is being pursued in the way that Diana was. Clooney should arguably be directing his anger at Meghan's father for speaking out, rather than those paid to report what he says."